Published: Oct. 16, 2015 at 02:35 p.m.
As we get ready for the sixth full Sunday of the NFL regular season, we're continually taking stock of who's up and who's down. It turns out that things appear to be on the upswing for a number of running backs while a few big name wide receivers have taken a turn for the worse. Ben Roethlisberger where have you gone? 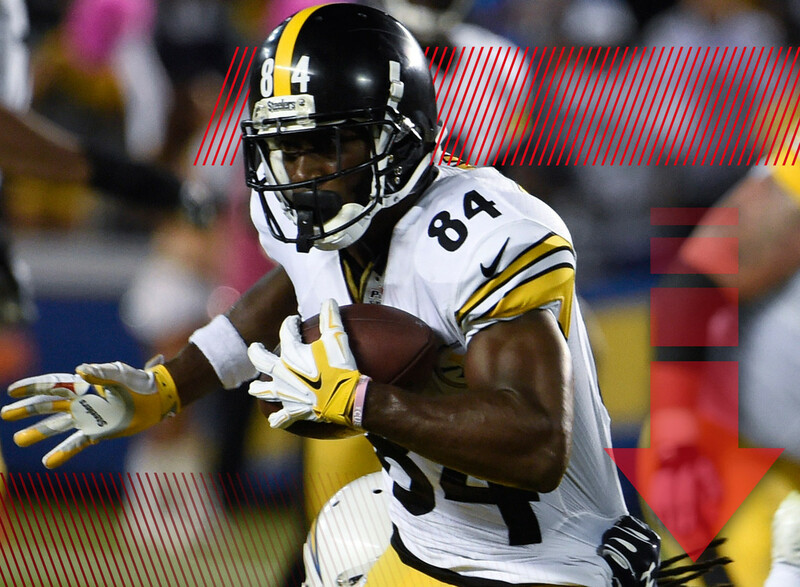 With Mike Vick under center, the superb Antonio Brown has been merely human for the past couple of weeks. As it turns out, there's no such thing as a quarterback-proof wide receiver. The upside is that this situation is temporary. There was a slight chance that Big Ben could return for Week 6 but he has been officially ruled out. He seems almost certain to get back in Week 7, though. Brighter days are ahead. Maybe it was all of the touches he got. Maybe the Eagles figured out how to use him. Maybe he was just angry. Whatever the reason, DeMarco Murray looked a bit like the running back that was a fantasy football savior last season. Whether that level of production continues remains to be seen. After all, there are still two other talented backs in Philadelphia that will need touches. But for the moment, all is well in Philly. Over the first five weeks of the season, Megatron has transformed into just an ordinary wide receiver who has scored double-digits just once this season. The struggles of Matthew Stafford and the Detroit offense have spread to the wide receiver position, where both Johnson and Golden Tate have been non-factors in fantasy. The hard part is ... do you have the guts to bench Calvin Johnson? Not sure that I do. When everyone was so sure that Jameis Winston just had to be better than Josh McCown, I was skeptical. So far that skepticism has borne fruit as the No. 1 overall pick has been a turnover machine to start the year. As such, Evans is in the midst of an all-out sophomore slump. With the Bucs taking some responsibilities away from Winston, it could mean fewer targets for Evans. Hopefully things get a little better after Tampa's bye week. Injuries are an unfortunate, but real, fact of life in the NFL. With Jamaal Charles finished for the rest of the season, West is the next man up in the Kansas City backfield. Andy Reid's proclamation that West is Charles-lite might be exaggeration, but it looks like he's going to be the lead back in a new committee that will also include Knile Davis. Cutler probably won't win you a fantasy championship, but in the right situation he can win you a couple of weeks. The much maligned quarterback has posted back-to-back solid performances and has another plus matchup in front of him against the disheveled Detroit Lions. He might be a punchline, but in recent weeks Cutler's fantasy owners have had the last laugh. Last week, I featured Ameer Abdullah in this space. This week, I'm down on another rookie rusher. There were high hopes for Gordon at the start of the season, but he has yet to pop despite San Diego's best efforts to feature him. In the meantime, Danny Woodhead has still been a big part of the Chargers offense. Until Gordon shows something, it's time to sit him down. The Barn Yard Dog has been all the rage recently and has honestly become a legitimate part of the Browns offense. This week's matchup against the Broncos isn't a great one on paper, but he could still see some targets to help slow down the Denver pass rush. In a fantasy world where tight end streaming has become more popular, Barnidge has had increasing value. After Week 2, people were clamoring to get Jones on their roster. Then again, a 24-point fantasy week will do that. In the games since, the rookie has barely topped 12 fantasy points -- combined. The Washington backfield continues to be a confusing maze, but it's becoming apparent that for the time being Jones is the odd man out. Ever since Eddie George retired, the Tennessee backfield has been a frightening place for fantasy owners (well, aside from those CJ2K years). The current committee is not one that inspires a lot of confidence, but Andrews has taken over as the goal line back and is starting to earn a larger share of snaps. As long as he's finding his way into the painted area, his stock will continue to rise.